Joe O’Toole, the man whose remarkable generosity resulted in the installation of the magnificent mosaic at Knock Shrine, has died. The Tuam-based businessman passed away on Saturday morning last after a brief illness. He had only recently celebrated his 87th birthday. Mr O’Toole was one of the most successful businessmen in the West of Ireland, having established a thriving supermarket in Tuam in the late 1960s. He continued to have an involvement in the day-to-day running of O’Toole’s SuperValu and was regularly on the shop floor, meeting and greeting customers whose parents and grandparents had shopped in his original VG supermarket 50 years earlier. Few men have had a greater influence on the town of Tuam than Joe O’Toole. The Headford native owned a vast property empire at the heart of the Galway town and single-handedly ensured the core of the town was protected at a time when many large supermarkets were seeking out-of-town locations. Instead, Mr O’Toole purchased a veritable jigsaw of town centre sites that allowed him to expand his supermarket footprint to nine acres, making O’Toole’s one of largest and most successful locally-owned supermarkets in the country. The business employs 130 staff and is a major contributor to the economy of North Galway. As well as being a hugely innovative, hard-working and honourable businessman, Joe O’Toole was also an outstanding community man who never refused a request for financial assistance from local organisations, sports clubs and other voluntary bodies. The mosaic in Knock is the most visible legacy of Mr O’Toole’s philanthropy but there are also countless stories of the quiet acts of kindness that were typical of a humble, decent man who never sought the limelight. 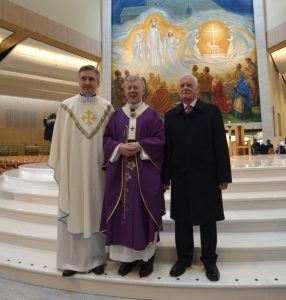 The late Joe O’Toole pictured with Archbishop of Tuam Michael Neary and parish priest of Knock Fr Richard Gibbons at the unveiling of the mosaic at Knock Shrine in 2016. Mr O’Toole’s remains will repose at the Palace Building beside his store in Tuam this afternoon (Monday) from 2pm to 7pm with Requiem Mass in the local Cathedral at 12 noon on Tuesday.